Looking for easy meals for dinner the whole family will enjoy? Conquer meal time with these chicken meal prep ideas using similar ingredients! 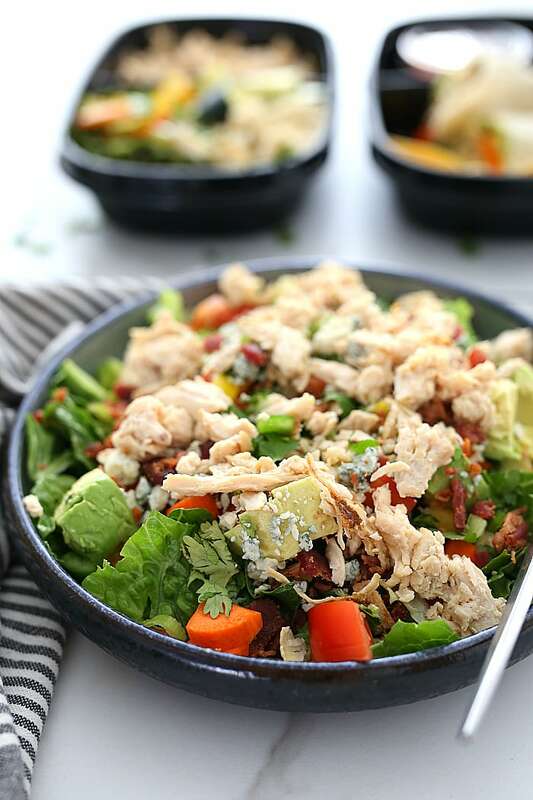 Pulled chicken breast cobb salad, chicken wrap and chicken quinoa bowls are easy, wholesome and gluten free! Who’s ready to have a bunch of ingredients that you can mix and match throughout the week to make dinners a breeze (and new and exciting) and meal prep lunches effortless? Me! 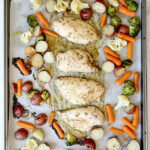 These flavorful chicken meal prep ideas do just that! The new year is always a good time for a fresh start with new and easy meal prep ideas. I love to use precooked frozen chicken as a main protein source then work around it with colorful sides. Meal prep saves a ton of time so you have more moments to do the things you love. It also makes packing weekly lunches easy since it can be done in bulk with similar ingredients. This time last year I had a big dream to raise chickens. I wanted to have fresh eggs every day for all the baking I do. Then it happened. I stepped into a store to get fresh vegetables to plant in my garden and I came out with four baby chickens. Total impulse move on my part. When I picked up my son from school with them chirping away in the car, his expression was beyond excited! My husband… not so much. Ladies, I highly suggest consulting with your spouse first before making a move like that😊… ha! Despite him not being a fan of the situation, we kept them and had a full year raising chickens. My boys thought it was Easter everyday going out and finding eggs! The good thing is raising chickens did not hinder our enjoyment of chicken recipes😊. 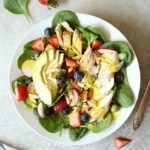 One or our favorites is this strawberry chicken salad. 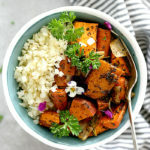 Guaranteed, these recipes will make your life easier and you’ll be surprised at just how easy it can be to make easy, healthy and delicious meals by doing a meal prep like this! 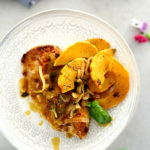 What you’ll learn here is how to make three delicious wholesome recipes that use similar ingredients with the main protein source being precooked chicken. These recipes make prepping healthy meals a breeze and if you are using your printable meal planner, don’t forget to add these ideas and ingredients! 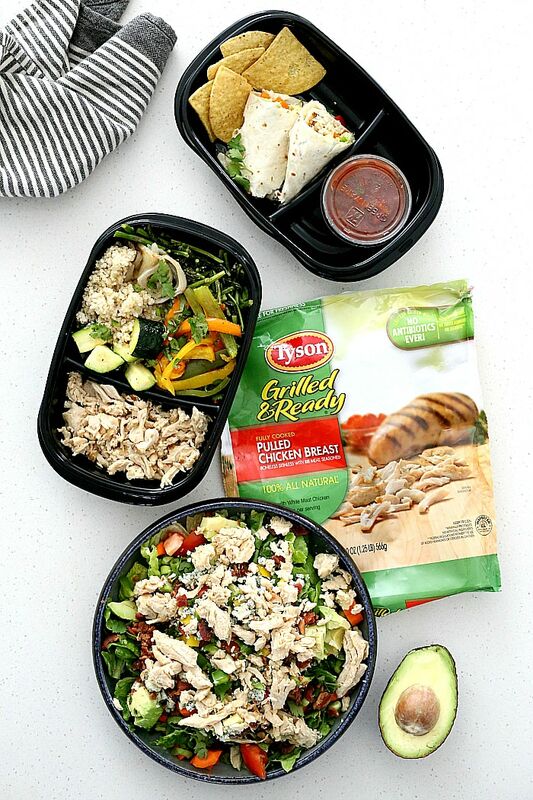 To make chicken meal prep even easier, use Tyson® Grilled & Ready® Fully Cooked Pulled Chicken Breast. The chicken is already cooked, flavored and ready! It’s absolutely delicious and contains no antibiotics ever, plus it’s 100% all natural, made with white meat chicken. Tyson Grilled & Ready Fully Cooked Chicken (they have Grilled Chicken Breast Strips, Pulled Chicken Breasts, and Grilled Chicken Breast Fillets) which can be purchased at Walmart. I used the Pulled Chicken Breasts, but you can use any kind for these recipes. Large carrots – some for roasting and some for the salad. Asparagus, zucchini and onion for roasting. Colorful bell peppers – half for roasting and half fresh. The greens! Green onions, cilantro, and crunchy romaine lettuce. The extras! Olive oil, salt, pepper, gluten free or (regular) tortillas, blue cheese crumbles, bacon crumbles, avocado. You can also add a hard boiled egg, but I kept the ingredients simple😊 so you didn’t have to make one more thing. Favorite dressing such as this green goddess dressing or drizzle with olive oil and lemon juice or apple cider vinegar. Shop once and gather all your ingredients. Pick one day to do the meal preparations. Have dishes clean and containers ready to store prepared meals. Have meats fully cooked and consume within 3-4 days (unless they are frozen). Cook grains and rice ahead of time and keep them stored in the refrigerator to add as a side or with poultry and meats. Chop and dice all vegetables in bulk and store in an airtight container in the refrigerator. That way you can easily have them on-hand to add to salads and in tacos, burritos, or wraps. Roast a bunch of vegetables in advance. 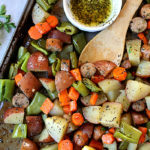 Roasting vegetables brings out their mouthwatering flavors! Prepare them ahead of time and add them to quinoa bowls and in tacos. Have on hand a good meal prep container for meals-to-go. – These are the best meal prep containers – Get them! Now that we have “how to meal prep” out of the way, guess what else? These chicken meal prep ideas are better choices for a better you! Why? Tyson Grilled & Ready chicken has between 13-21g of protein per serving (depending on the product used), is 100% all natural, made with white meat chicken and can be found at your local Walmart in the freezer section. From 1/12/19-2/10/19, save $1 on one Tyson® Grilled & Ready® product at Walmart with this Ibotta rebate offer. Any one of these meals is great way to get your daily dose of protein! Thank you Tyson Foods, Inc for sponsoring this post. Enjoy more by following them on Facebook, Twitter, and Instagram. Conquer meal time with these chicken meal prep ideas using similar ingredients! 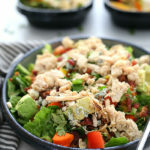 Pulled chicken breast cobb salad, chicken wrap and chicken quinoa bowls are easy, wholesome and gluten free! Prep and make ahead of time and use throughout the week. Heat chicken according to package directions. On a tortilla add avocado, fresh pepper slices (roasted peppers and onion), cilantro and chicken. 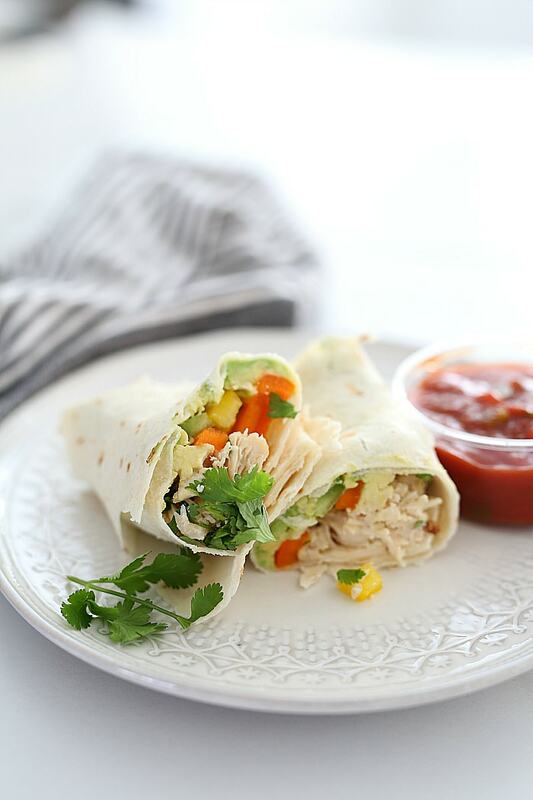 Fold into a burrito and serve in a meal prep container or plate with salsa and chips. Heat chicken according to package directions. 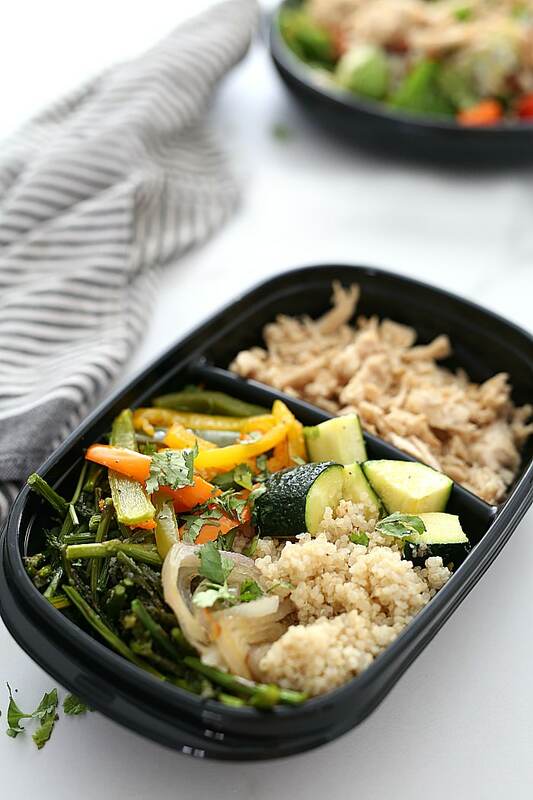 On a plate or meal prep container add quinoa, roasted vegetables and chicken. Garnish with fresh cilantro and add salt or lemon juice to taste. These recipes you can mix and match everything into these three meals. Use the quantity you need for if it is weekly lunches, dinners, or both. Keep roasted vegetables and cooked quinoa ready to reheat for easy dinners. Have all fresh vegetables chopped and ready to use as needed. Below is the quantity I used, which made about 2 large salads (or 4 small), 4 quinoa bowls in meal prep containers, 2 wraps/burritos. Tyson® Grilled & Ready® Fully Cooked Pulled Chicken Breast, 20 oz. Calories listed are for 8 ounces pulled chicken only. If you have any questions on how to prep meals and these meal prep ideas, please email me or comment below.